(CNN) -- Bou Meng walks into a big open room, sits down on the floor and points to a number, which is stenciled on the wall. Number 13. It was his prison number and the spot on the floor where he says he was shackled in Cambodia's infamous Tuol Sleng Prison. The prisoners who entered were often killed. 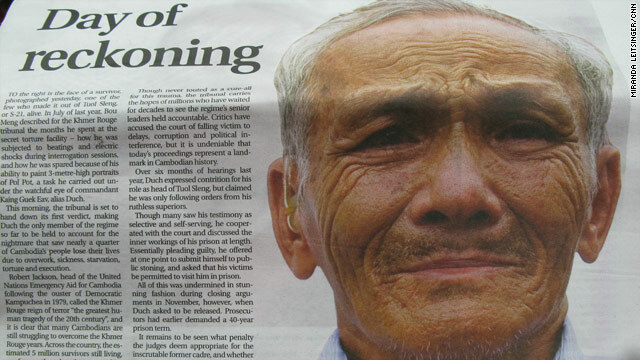 Bou was one of the few who survived the torture, starvation and executions routine when the Khmer Rouge were in power. Led by the late Pol Pot, the regime was responsible for the deaths of millions of ordinary Cambodians during a four-year reign of terror that was eventually halted in 1979 by invading Vietnamese forces. But the memories of this dark chapter continue to haunt victims such as Bou more than 30 years later, as four surviving members of the Khmer leadership, including Pol Pot's "number two," prepare to stand trial for their alleged role in the genocide. In 1975, the Khmer Rouge ordered everyone out of the capital Phnom Penh and other cities in Cambodia to work in the countryside as farm laborers. Bou, an artist, was sent off to work in the paddy fields. One day in 1977, he was told he was being moved away from farm life. "I was supposed to move to the Royal University of Fine Art, but instead I was brought to S-21, also known as Tuol Sleng Prison," he says. "The first thing I saw was the people that had long hair to the waist. Their eyes were sunken and their bodies were only bone and skin. I was so shocked." It didn't take long before the plight of the others became his fate. He was tortured mercilessly. But art saved his life. The prison officials asked him if he could draw Brother Number 1, the man known as Pol Pot, the leader of the Khmer Rouge. Bou said yes. They were impressed by his work, so he began working on a huge portrait that would take him months. 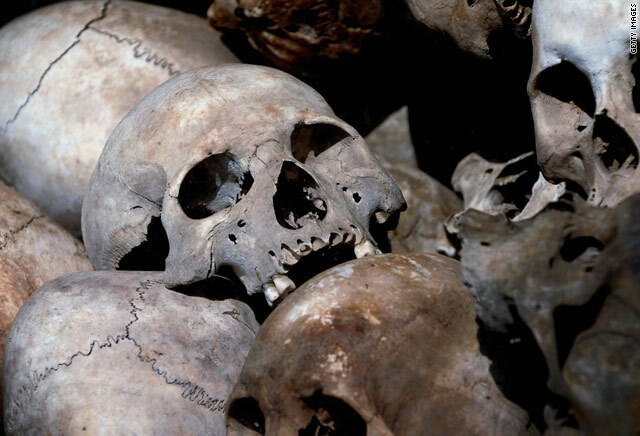 The Khmer Rouge government was then wreaking havoc on the entire country. It is said to be responsible for about 1.7 million deaths, roughly a quarter of the population back them. Its aim was to create a Communist utopia but instead the regime forced Cambodians into a living hell. City dwellers were marched into the countryside and forced to work as farm laborers. Those already living in rural Cambodia were expected to produce enough food for the country while teaching farming to those who had never done it before. Currency was abolished, and anyone with an education was considered a threat. No one was allowed modern medicine and the country isolated itself trying to become completely self-sufficient. The results were disastrous: People died of starvation and disease as soldiers tortured and killed anyone suspected of being disloyal. Eventually, everyone, including the soldiers, became a target due to the leadership's paranoia. Tan Than was a soldier, although he says he never had a gun and was only given farming tools. By 1978, a year before the fall of the Khmer Rouge, Tan and all the soldiers in his brigade were arrested and sent to work on an airport. Tan said he saw people dying of hunger as they tried to build the airport and the road leading up to it. Cambodians have been waiting for more than 30 years for someone to be held accountable for what happened during the years the Khmer Rouge was in power. As he walks up to the airport road where he once toiled, he suddenly begins to sob. It is the first time he has been back since 1979. "I cry when I remember the people and my older brother who they separated from me." He has not seen his older brother since. He doesn't even know where the body is buried. Tan himself was supposed to be one of the tens of thousands of bodies dumped in what have become known as the "killing fields" located all over Cambodia. But Tan and a few others in his brigade fought back the day they were supposed to die. He says when the soldiers came into the building where all 292 members of his brigade had been taken it was clear they meant to exterminate them. "When we got inside they were shouting you betrayed (us). You are Vietnamese. You are American. You are CIA. Then they came inside the house and we fought back." He and 12 others escaped. Tan's sister-in-law Long Saoda worked at the same site where the soldiers were taken and watched in horror the fate of hundreds of unarmed people. "I saw a truck full of people. ... I hid and tried to listen more. Then I saw them (soldiers) holding guns. They were hiding in the forests on both sides with guns," she recalls. "Shoot, shoot, shoot, bang, bang, bang," Long re-enacts with her hands. "...When the people got off the truck they tied their hands and then they walked the people to the hole they had dug, then they killed all those people and then the second truck came." Eventually, she says, a tractor would cover the hole with dirt even if the people inside it were still alive. There are still two noticeable indentations where villagers point out you can still see the gravesites in their village. Similar scenes were repeated around the country. More than three decades on and the story is not yet over. The remaining leaders of the regime are finally being put on trial. The indictment, more than 350 pages long, includes accusations of everything from genocide to torture to war crimes. Case number 002 is the second and perhaps most important case being heard by the United Nations-backed tribunal in Cambodia. "They are alleged to be responsible for the whole policy, which ended up in crimes being conducted all over this country," says Lars Olsen, the spokesman for the Extraordinary Chambers in the Courts of Cambodia. "It is probably one of the first times since the Nuremburg trials (the case against the Nazis that began in 1945) where the whole remaining political leadership ... have been put on trial together. Cambodians have been waiting for more than 30 years for someone to be held accountable for what happened during the years the Khmer Rouge was in power." Tens of thousands of people from around Cambodia are expected to come watch the trial, even if for only one day. As for Long Saoda, Tan Than and Bou Meng, they hope the trial provides the answer to one question that has haunted them all these years: Why would a government treat its own people this way? CNN's Tim Schwarz contributed to this report.